Product #21090 | SKU 2440280 | 0.0 (no ratings yet) Thanks for your rating! 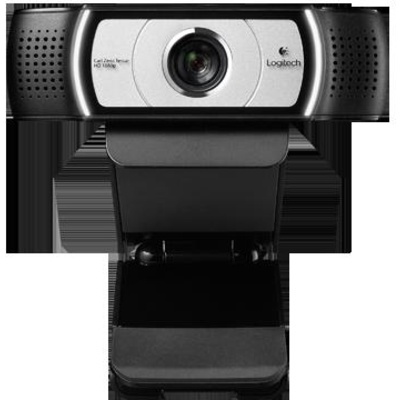 The Logitech Webcam C930e is a sophisticated web camera. The first 1080p HD webcam to support H.264 with Scalable Video Coding and UVC 1.5 encoding technology. Frees up PC bandwidth by putting video processing within the camera, adjusting dynamically to the available bitstream. The result is a smoother video stream in applications like Microsoft® Lync™ 2013. The camera's wide 90° diagonal field of view covers everyone on group calls, so there's no need to reposition the camera! Get razor-sharp images, even on close-ups, from a glass autofocus lens engineered with the aid of industry legend Carl Zeiss. Omni-directional dual stereo microphones provide great audio quality in offices or compact conference rooms. For your convenience, the webcam is mountable on an LCD screen, notebook, tabletop or wall with the attached clip, or on a tripod via the embedded thread. UVC compliant, the camera also features plug-and-play operation with the majority of video conferencing and UC applications.